A Mongolian horse-head lute of carved wood with a carved horse head, plaque and inscription. The bow of wood with horse hair, all in a grey bag. CD of soundtrack of 'Eternal Power of the Sky'. With carrying case. 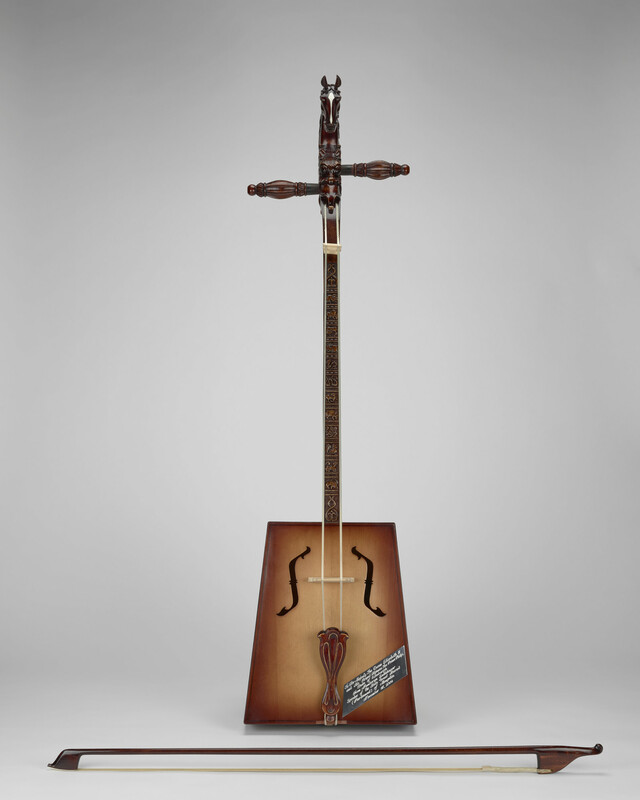 The morin khuur is a traditional Mongolian stringed instrument made up of a rectangular sound box and long neck surmounted by a carved horse's head, below which are two tuning pegs, resembling ears. The two strings are traditionally made of horse hair as are the strings of the bow. Morin khuur roughly translates as 'horse fiddle' due to the legends surrounding the origin of the instrument, based on beloved horses after their death being used to create the instrument which is also said to have a sound like a horse neighing; some of these stories date back to the 13th century and are part of the Mongolian cult of the horse. The instrument is sometimes played to accompany folk dances and the telling of stories; it has also been used to tame horses. The morin khuur is a traditional Mongolian instrument, taught at three schools in Mongolia and considered the national instrument. It is played with the body held between the legs and the neck resting on the shoulder.